retains the full potency of the 165 compounds found in the pulp of noni. The result is a raw whole food concentrate (not juice) and noni lotions that are extremely potent and effective. Noni Fruit Leather boosts the immune system, lowers blood sugar levels, cholesterol levels and blood pressure levels. It also improves joint functions and good joint health, plus relieves pain. 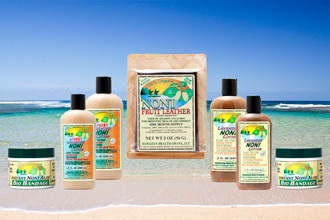 Our Noni Lotions are used for pain relief, inflammation, muscle aches, cramps and many types of skin ailments. All natural way of healing for people and pets. Our products are used by licensed practitioners, sports trainers and individuals like yourself with great results. Many Veterinarians are using our noni products on dogs, cats and horses. Noni: a traditional Polynesian medicinal fruit backed up by current day research.